Under an hour from Adelaide, the McLaren Vale Wine Region is ready to spoil your palate, with over 50 restaurants and 80 cellar doors to excite and tempt you. With new experiences further celebrating the diversity of the region, you won’t be short of options when it comes to treating your tastebuds. The hard part? Deciding where to feast your senses first. 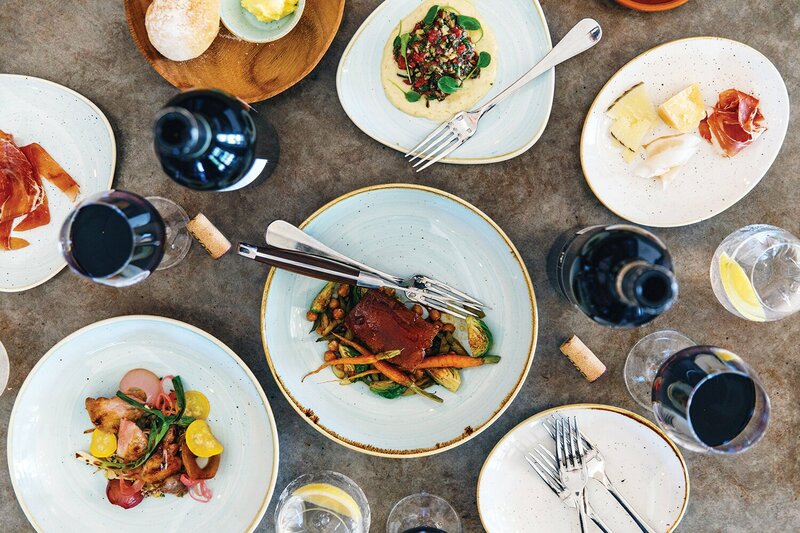 Part of South Australia’s Epicurean Way, the region features a range of delectable offerings, from historic wineries and cosy cellar doors, to modern tasting pavilions and state-of-the-art dining. In the last year a new wave of innovative architectural additions and unique experiences have been making their mark on the region’s food and beverage scene. One that is most likely featured on your ‘must do’s’ (or should be) is d’Arenberg’s iconic Cube, which has gained national and international attention as one of the country’s premier food, wine and architecture destinations. “The Cube is a tasting room, high end restaurant, contemporary art museum and function centre,” says Chester Osborn, owner and chief winemaker at d’Arenberg. The towering glass Rubik’s cube structure has been the talk of the nation, offering an exclusive dining experience (including the only 3D food printer in the country), a variety of tastings and an unforgettable immersive arts experience. For many, it marks the beginning of an exciting time for the coastal wine capital. Australia’s National Young Gun of Wine Award was presented to McLaren Vale winemaker Rob Mack of Aphelion Wines. The Salopian Inn has been named in Australia’s Top 100 Restaurant Awards, chosen by the nation’s top chefs and restaurateurs. d’Arenberg’s Cube has taken out a Good Design Award in the architectural design category. Mulberry Lodge collected bronze at the Australian Tourism Awards. Mitolo recognised in Gourmet Traveller Wine Magazine top 50 wine experiences in the world 2018, and also listed in Australian Financial Review top 500 restaurants in Australia 2018. The region is a member of the prestigious Great Wine Capitals of the World Network, recognising premier wine destinations across the globe, for their tourism offering, quality produce and innovative wine production. McLaren Vale joins renowned international wine regions Napa Valley and Bordeaux. Boutique breweries and distilleries are popping up throughout the region, while wineries are presenting bespoke tasting opportunities, many with food matching experiences. It’s an exciting time to visit. While new offerings abound, old favourites still remain a highlight for visitors and locals alike. Some regional stalwarts include the iconic Victory Hotel, family-owned Kay Brothers winery, clifftop Star of Greece restaurant, historic Wirra Wirra and many more. “I love McLaren Vale, Mitolo Wines is stunning, the rosé is superb and The Star Of Greece restaurant at Port Willunga is an all time favourite …the area is divine. Incredible,” says actor Hugh Sheridan, a regular to the region. Whether you settle in for a premium structured tasting for the afternoon, grab a pizza to enjoy at the beach, marvel over Instagram-worthy desserts or sip a local drop on a picnic rug, the region can make your tastebuds sing. So try something new, book in for a masterclass and soak up this spectacular region in all its delicious glory. Previous Previous post: What Makes McLaren Vale Wine So Unique?